We, the people, are idiots. Please, for pity’s sake, ignore us more often. Currently 117 people agree with him. I, for one, am not planning to join them, as I happen to think democracy is probably for the best (particularly given the violent alternatives playing out around the world at the moment). However, a scan of the 41 petitions currently more popular than Joseph’s doesn’t seem to be a particularly encouraging demonstration of e-democracy in action – or not yet anyway. Regardless of the subject matter, it seems that we, the people, are not very organised. In the top 40 there are currently 5 separate petitions calling for a return of capital punishment, and 5 against it. There are 2 petitions calling for F1 to be free to view in the UK, and 2 asking for the legalisation of cannabis/recreational drugs. And there are many more on all of these subjects further down the list. 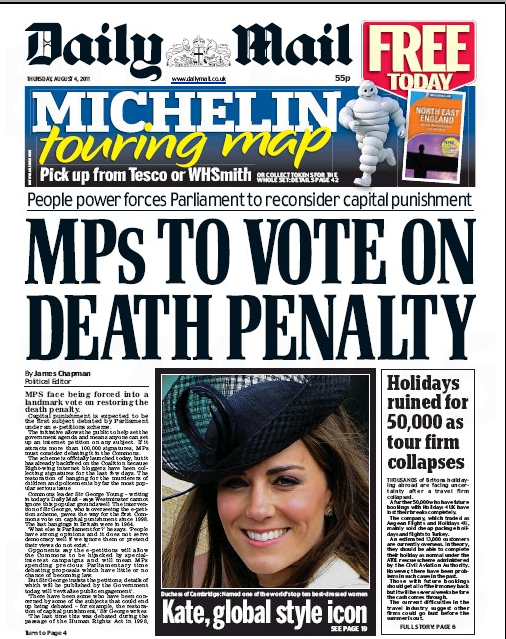 OK, so it’s only the first week, and the numbers are fairly small (10,621 against capital punishment, and 7,555 for… and only when you add them all up), but it’s a shame that none of the larger more organised campaign groups or charities seem to have taken advantage of the early publicity. Admittedly the Speaker only announced the launch of the site a week ago, but there’s been talk of it for a while, with government giving the project the go ahead back in December. I would have thought a big campaign group or charity could have galvanised its supporters, particularly those they already engage with online, and made a bit of a splash in this first week. Regardless of whether you think epetitions, and the UK government’s latest initiative, are a bit of a gimmick, or a genuine evolution of democracy in the digital age, this week has shown that it’s possible to use these tools to grab the headlines and push the debate off the web and onto the front page. We don’t yet know whether petitions from this site will influence government policy, or change laws, but we have seen that they can raise awareness and spark a debate. I’m sure there will be more organised and larger scale use of the epetitions site over time, just as there have been on Avaaz. It’s just a shame that none of them were on hand to take advantage of the press hype around the launch. Hi, hello, good evening/afternoon/morning and good welcome, my real name’s Joseph Blurton. I’ve elaborated on my petition here: http://shrubhill.blogspot.com . Like you, I’m a democrat. I do believe that Governments should submit manifestos and policies to the people for broad approval, but I don’t believe that the people, myself included, are well-informed enough to make sane, rational decisions on important individual matters of policy. Elections are based merely on moods; on a feeling of relative well-being or faith in a Government’s competence. Serious policies shouldn’t be left in the hands of idiots like me. We need a better class of MPs able to govern and lead, not a wittering, twittering class ruling all. It just spells mayhem. That’s this idiot’s two-penneth, anyway.